Remove dirt and wax from the surface of fruits and vegetables with Earth Friendly's Fruit & Vegetable Wash. Washing with water alone, will not remove wax that is used as a rain-proof medium to apply agricultural chemicals. 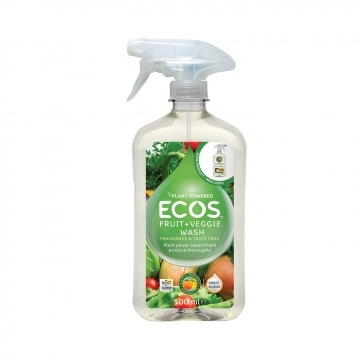 Fruit and Vegetable Wash is tasteless and rinses clean away. How to use: Cleaning fruits and vegetables such as apples and potatoes: spray enough to cover the entire fruit, rub then rinse with water. Salads: Either spray directly onto the salad vegetables or dilute in a bowl of water and soak. Then rinse clean. Ingredients: Water, Alcohol Denat. (corn-derived), Plant-Based Surfactant (<5% non-ionic), Potassium Sorbate (plant-based food grade preservative), Citric Acid (plant-based pH adjuster).FRAGRANCE FREE .